CAPE CANAVERAL, Fla. – NASA has begun fueling its youngest orbiter, the space shuttle Endeavour, for one last journey to space today (April 29). Endeavour is set to launch on its 25th and last voyage at 3:47 p.m. EDT (1947 GMT) from here at NASA's Kennedy Space Center. Weather forecasts predict a 70 percent chance of clear skies, but if clouds or strong winds linger at the launch pad NASA may have to delay the liftoff. The shuttle's veteran crew of six, including pilot Gregory H. Johnson and mission specialists Michael Fincke, Greg Chamitoff, Andrew Feustel, and European Space Agency astronaut Roberto Vittori, will be led by commander Mark Kelly. Lightning and thunderstorms rolled through the shuttle's launch site last night, producing some spectacular photos of lightning behind Endeavour. The storms delayed the removal of the shuttle's protective metal scaffolding until around midnight, but should pose no issue to launch plans, NASA officials said. The space shuttle Endeavour is seen on launch pad 39a as a storm passes by prior to the rollback of the Rotating Service Structure (RSS), Thursday, April 28, 2011, at Kennedy Space Center in Cape Canaveral, Fla.
Endeavour's last launch has drawn throngs of spectators to the Florida Space Coast to glimpse the shuttle liftoff – one of only two orbiter launches remaining before NASA retires its 30-year-old shuttle program for good. More than 700,000 people are expected to watch the shuttle flight, even though it is occurring on the same day as the much-anticipated royal wedding between Prince William and Kate Middleton in England. The astronauts of STS-134 came to Kennedy Space Center recently for countdown rehearsal. 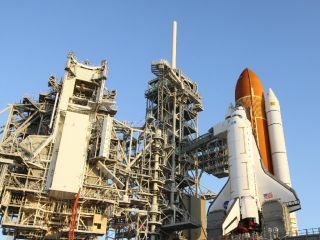 The real countdown for Space shuttle Endeavour is scheduled for Friday afternoon, April 29, 2011. From left, the astronauts are Commander Mark Kelly, Pilot Gregory H. Johnson and Mission Specialists Mike Fincke, Drew Feustel, Roberto Vittori and Greg Chamitoff. Another high-profile attendee will be Kelly's wife, wounded Congresswoman Gabrielle Giffords, D-Ariz. Giffords survived a January assassination attempt when a gunman opened fire on her and others outside a Tucson, Ariz., grocery store. She traveled from her rehabilitation hospital in Houston to Florida on Wednesday. Giffords' shooting was devastating for the close-knit crew, who pulled together to support each other in its aftermath, according to the astronauts. The spaceflyers, especially Kelly, had to call on their training to compartmentalize their feelings and focus on the mission when the job was at hand. Endeavor's main mission is to carry up a particle detector that aims to revolutionize astrophysics and cosmology. The Alpha Magnetic Spectrometer (AMS) will be installed on the space station to search for cosmic ray particles that might shed light on cosmic mysteries such as the invisible dark matter that is thought to permeate the universe. "It's the premier physics experiment; it's probably the most expensive thing ever flown by the space shuttle," Kelly said in a NASA interview. In addition to carrying AMS, Endeavour will also be packed full of 14,000 pounds (6,350 kg) of spare supplies to outfit the space station for the era after the shuttles stop flying. The mission will deliver a new tank of ammonia coolant, equipment for the Dextre robot, and spare parts for the laboratory's antenna communications system. To help install some of this equipment, and to perform various maintenance tasks on the space station's exterior, the shuttle astronauts plan four ambitious spacewalks. The mission is slated to last 14 days, but NASA officials have said they may extend the flight by two extra days to allow the astronauts to get more work done. "We know the end is coming and we're dealing with it," shuttle launch director Mike Leinbach said. "The emotional aspect is very, very real and it's very difficult to put into words, but I think all of Kennedy Space Center got a big boost when we got the word that were going to be able to keep Atlantis." NASA administrator Charles Bolden recently announced the retirement locations for the space shuttles. He bestowed Atlantis on the Kennedy Space Center Visitors Center, Endeavour on the California Science Center in Los Angeles, and Discovery on the Smithsonian's National Air and Space Museum in Washington, D.C.
After each orbiter completes its last mission, it must go through a months-long process to outfit it for public display. Museum goers can expect to get their first up-close look at the space shuttles sometime in the next year or two. After Endeavour's STS-134 mission, NASA plans one more shuttle flight — the June launch of Atlantis — before the space shuttle program draws to a close.